A denture is a removable replacement for missing teeth and surrounding tissues. Made from acrylic resin, porcelain and other materials, dentures are a comprehensive and reliable solution and economical solution for replacing all your missing teeth and for restoring your smile. Those looking to undergo the denture process should consider the cost of dentures, different types, common concerns and denture care. Restore Your Youthful Smile and Appearance with Dental Dentures! The denture process takes about one month (or five dental appointments). First, an impression of your jaw is made using special tools and materials. In addition, measurements are made to show how your jaws relate to one another and how much space is between them, also known as your bite relationship. The shade of your natural teeth will also be determined. 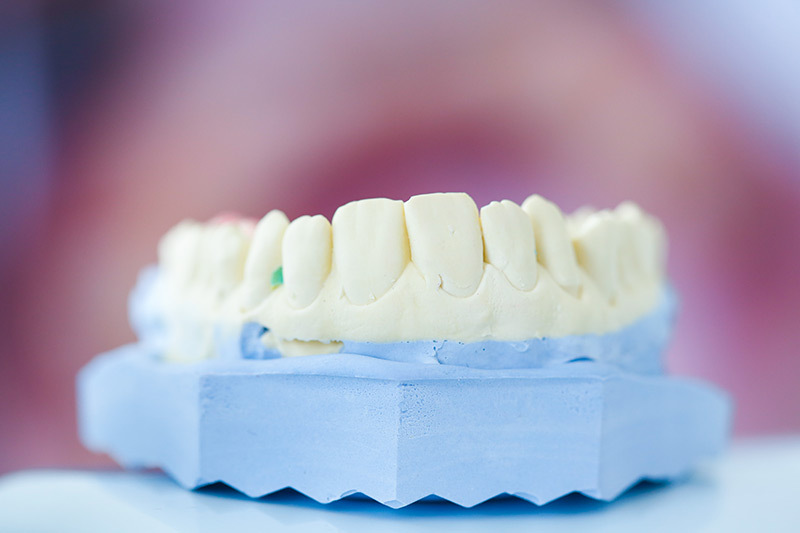 The dental laboratory makes a mold or model of your jaw, places the teeth in a wax base and carves the wax to the exact form wanted in the finished denture. Usually a “wax try-in” of the denture will be done at the dentist’s office so any adjustments can be done before the denture is completed. The dental laboratory finishes the denture using a “lost wax” technique. A mold of the wax-up denture is made, the wax is removed, and the remaining space is filled with pink plastic in dough form. The mold is then heated to harden the plastic. The denture is then polished and ready for wear. Generally, there are two types of dentures: complete dentures and partial dentures. Made when all of your natural teeth are missing. You can have a full denture on your upper jaw, lower jaw or both. Also called “conventional” or “immediate” because of when they are made and when they are inserted into the mouth. Immediate dentures are placed into the mouth immediately after the removal of any remaining teeth. An advantage of immediate dentures is that the patient does not have to be without teeth during the healing period. However, bones and gums may shrink over time, especially during the period of healing in the first six months after teeth removal. When gums shrink, immediate dentures may require rebasing or relining to fit properly. A conventional denture can then be made once the tissues have healed. Healing may take at least 6-8 weeks. A partial denture is suitable for those who have some natural teeth remaining. 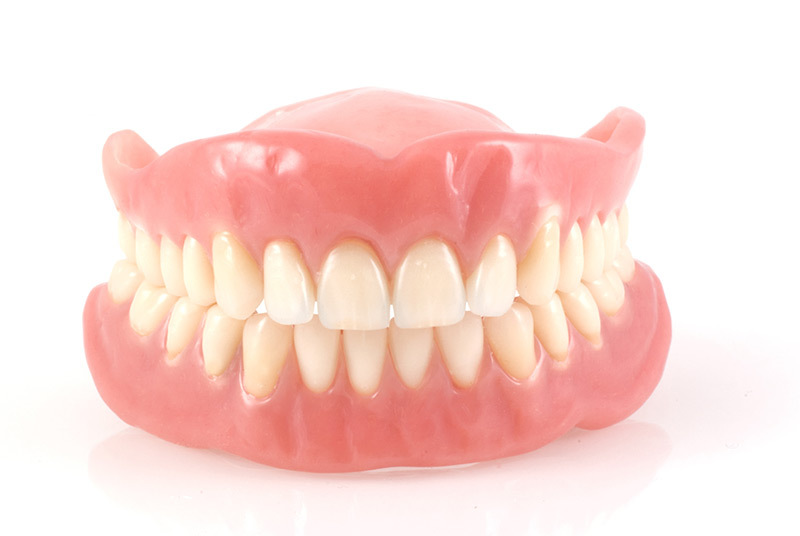 A denture improves chewing ability, speech and provides support for facial muscles. It will greatly enhance the facial appearance and smile. Removable partial dentures usually consist of replacement teeth attached to pink or gum-colored plastic bases, which are connected by metal framework. 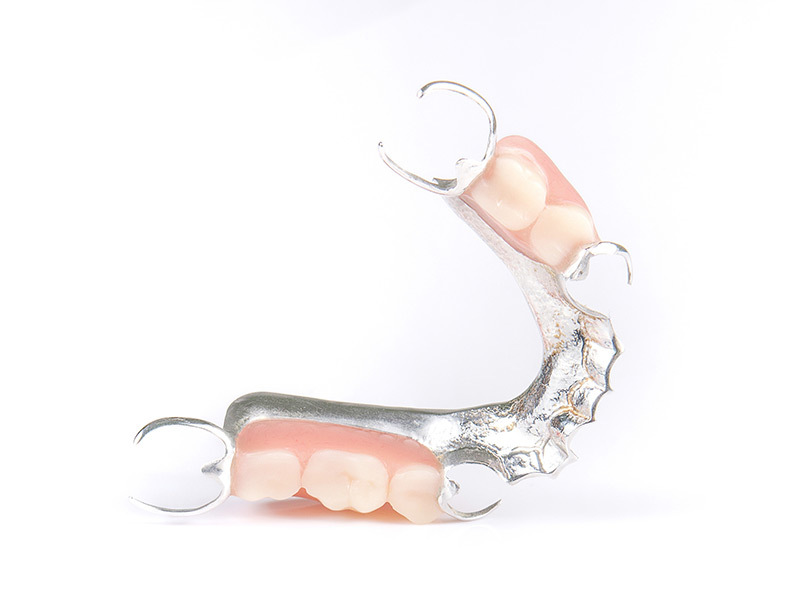 Removable partial dentures attach to your natural teeth with metal clasps or devices called precision attachments. Precision attachments are generally more aesthetic than metal clasps and are nearly invisible. Crowns on your natural teeth may improve the fit of a removable partial denture and they are usually required with attachments. Partials with precision attachments generally cost more than those with metal clasps. Dentures today are made from very advanced materials designed to give patients a natural and refined appearance. But just like regular teeth, dentures should be cared for with equal diligence and attention. This means daily brushing and regular visits to your dentist. Dentures need to be cleansed of plaque, food particles and other debris. Keeping your dentures in top shape will also help keep the soft tissues of your mouth healthy; an unclean or malformed denture can cause infections and irritation. It’s best to stand over a folded towel or a sink of water when handling your denture, just in case you accidentally drop it. Brush the denture (preferably with a denture brush) daily to remove food deposits and plaque and keep it from becoming permanently stained. Avoid using a brush with hard bristles, which can damage the denture and look for cleansers with the American Dental Association (ADA) Seal of Acceptance. Hand soap or mild dishwashing liquid to clean dentures is also acceptable. Other types of household cleaners and many toothpastes are too abrasive and should not be used for cleaning dentures. 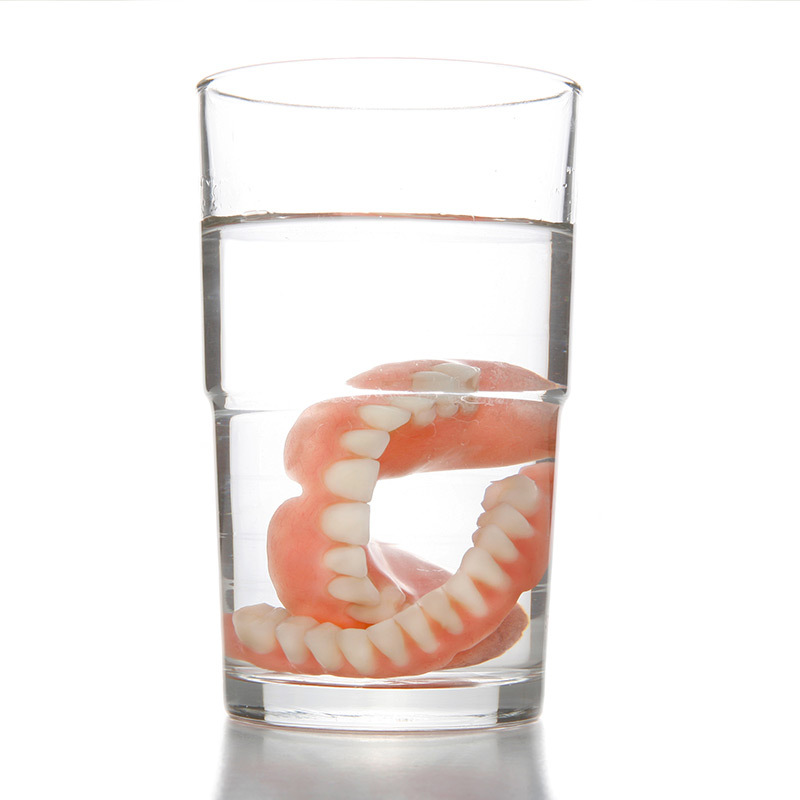 At night, the denture should be placed in soaking solution or water, as it could lose its shape if not kept moist. However, if the appliance has metal attachments, they could be tarnished if placed in soaking solution. Pronouncing certain words may require practice. Reading out loud and repeating troublesome words will help. If your dentures “click” while you’re talking, speak more slowly. You may find that your dentures occasionally slip when you laugh, cough or smile. Reposition the dentures by gently biting down and swallowing. If a speaking problem persists, consult with your denture specialist. Over time, denture adjustment may be necessary. As you age, your mouth naturally changes and your bone and gums can recede or shrink. Loose dentures can cause various problems, including sores and infections. Avoid using a do-it-yourself kit to adjust your dentures, as this can damage the appliance beyond repair. Glues sold over the counter often contain harmful chemicals and should not be used on a denture. If your denture no longer fits properly, breaks, cracks, chips or if one of the teeth becomes loose, see your dentist immediately. In many cases, dentists can make necessary adjustments or repairs, often on the same day. Complicated repairs may require that the denture be sent to a special dental laboratory. If you are a candidate for Dentures in the Philadelphia or Main Line area, call the Advanced Restorative Dentistry office of Dr. James Vito today (610) 971-2590.